The Carnivore jacket by black brand is a great looking, very well made “classic” style jacket. The offset zipper and wide double collar are key design features. Note: This jacket is a slightly distressed darker brown rather than black (like the factory images show). Functionally, this jacket is a lot like the Carry On jacket but without the straps to bundle the jacket into a roll (read all about that on the Carry On product page). This jacket has a couple zip vents on the biceps and two vertical zips in back so it will move “some” air, but I don’t think this jacket will be comfortable in hot weather. But it will shine in colder weather. The removable thermal liner is thicker than average and is full sleeve, and with the leather shell, I think it would do well in cold weather. So lets say this one will work in cold to warm weather. As I mentioned above, the leather is a slightly pre-distresses darker brown color. There are several nice styling details here… the expansion material behind the shoulders (which are also functional to improve mobility), the quilting on the elbows and kidney area and the large side waist adjuster buckles. I also think the perf leather collar trim is sharp too. This jacket doesn’t come with armor, but you can add D3O in the pockets that are built into the shoulders, elbows and back. I’d suggest the CE level 1 armor for this jacket. I think the thicker stuff would make the arms and shoulders too tight for most people. 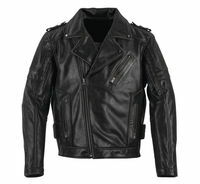 Black Brand says: Want a jacket that looks like Johnny wore in The Wild One but you need to make your own statement when on your bike? The Carnivore delivers unique style, loads of features including a conceal carry pocket and all day riding comfort.